New lands have opened up and the race is on to create the best network of rail and road lines through it. 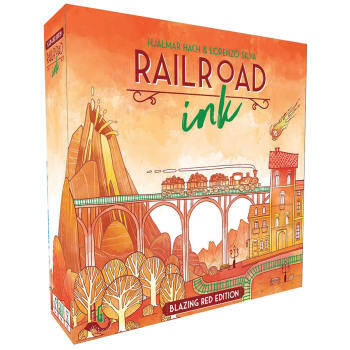 In Railroad Ink, players roll the Route dice and must then draw the subsequent results on their individual Route boards. Players score points for having long interconnected Routes, as well as connecting the entry points to their board, plus having Routes through the center of their boards. But beware, they'll lose points for leaving unfinished lines. It's a challenge to keep their roads and rails from getting destroyed, and having to repair them when they are. Or, players can combine the two for epic, 12-player games! The Blazing Red Edition challenges players with falling Meteors and erupting Volcanoes. Can players keep their Routes together amid all the carnage?